Perforated shell from Cueva Antón possibly used by Neanderthals as a pendant. (PhysOrg.com) -- Neanderthals used makeup and jewellery challenging the idea that they were cognitively inferior to early modern humans, according to research published in the Proceedings in the National Academy of Sciences today. 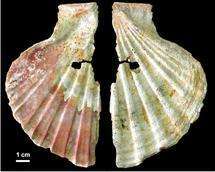 Radiocarbon dating by researchers at Oxford University suggests that pigment-stained and perforated marine shells were almost certainly used as pendants by Neanderthals in Spain 50,000 years old. This is significant because until now the practice of body ornamentation has been widely accepted by archaeologists as evidence for modern behaviour and symbolic thinking in early modern humans and not Neanderthals. The international research project, led by Bristol University, focused on two Neanderthal-associated sites in the Murcia province of south-east Spain (Cueva de los Aviones and Cueva Antón). Alongside the shells were lumps of red and yellow pigments, which researchers believe were used in cosmetics. A spondylus gaederopus shell contained residues of a reddish pigment made of lepidocrocite mixed with ground bits of hematite and pyrite (which, when fresh, have a brilliant black, reflective appearance), suggesting they were applied ‘for effect’. The choice of a spondylus shell as the ‘makeup container’ may relate to the attention-grabbing crimson, red, or violet colour and the exuberant sculpture of these shells, which have led to their symbolic- or ritual-related collection in a variety of archaeological contexts worldwide. A concentration of lumps of yellow colorant from Cueva de los Aviones (most certainly the contents of a purse made of skin or other perishable material) was found to be pure natrojarosite - an iron mineral used as a cosmetic in Ancient Egypt. Dr Thomas Higham, Deputy Director of the Radiocarbon Unit in the School of Archaeology said: ‘Dating samples that approach the limit of the technique, at around 55,000 years before present, is a huge challenge. We used the most refined methods of pre-treatment chemistry to obtain accurate dates for the sites involved by removing small amounts of more modern carbon contamination to discover that the shells and charcoal samples were as early as 50,000 years ago. Would somebody point me to research that suggests they were stupid?